What are the best baby wipes? If you ask us, they should shield and soothe baby's skin after every diaper change. Extra-mild and non-irritating, Baby Dove Rich Moisture Baby Wipes are suitable for using all over not only on baby's bottom, but to gently clean delicate hands, face and body, leaving your baby.s skin feeling soft. If you like baby wipes that leave your baby's skin perfectly clean, as well as moisturized, these Baby Dove baby wipes remove impurities whilst moisturizing instantly. With a dermatologist and pediatrician-tested, hypoallergenic and alcohol-free formula, there.s no need to look for special newborn baby wipes. 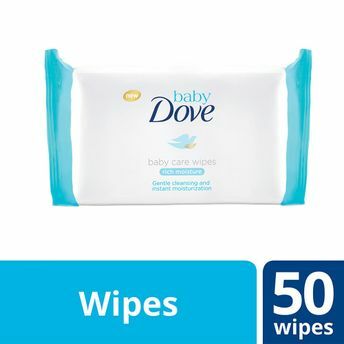 Baby Dove Rich Moisture Baby Wipes are gentle as water and suitable and safe for your littlest little one. And with an easy-to-use pack that stays fresh once opened, you can easily pull individual baby wipes to get to the action quickly and effectively. Buy Now! Explore the entire range of Cotton Buds, Balls & Wipes available on Nykaa. Shop more Dove products here.You can browse through the complete world of Dove Cotton Buds, Balls & Wipes .